Now this is not a subject that I am an expert at, but I have the information about how to look after a pet snake from experts who do know. One of these snake crazy people is Kellie Ryan who is my local snake catcher. I met her when she came to clear my property of a deadly brown snake that was seen entering my yard! I was amazed at the fact she showed no fear, but just got on with the job, and after every inch was checked to make sure the snake had left my yard, we got talking about publishing a pet snake book. One thing led to another, and Kellie agreed to overhaul the book published by me as Strategic Services, and is now for sale on Amazon in both a softcover printed book and as a Kindle download! If you are looking for VERY comprehensive snake care training as this book covers everything in three sections, about how to look after a pet snake, how to take care of any snake health problems, and even how to breed snakes if that is your goal! You can read more about all the amazing subjects that this book covers, lower down on this page. To help you get started in your research, below are some general informational posts to help you in the care of your pet snakes, and in selecting snake breeds to adopt if you are still comparing breeds and so on. But anyone who is serious about learning how to look after a pet snake for a long and healthy life needs to get their hands on this exclusive and brilliant book, it really is... 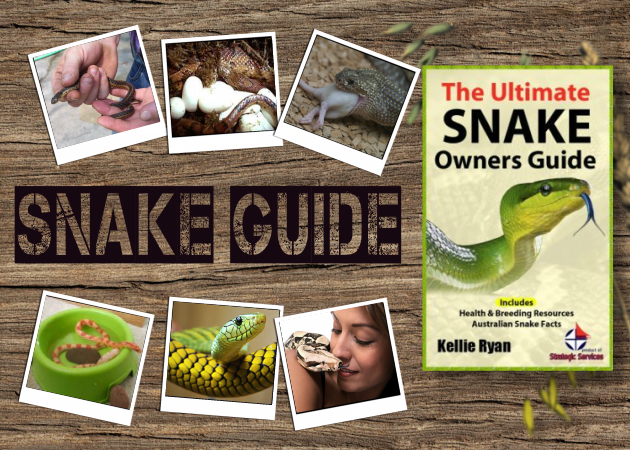 The Ultimate Snake Owners Guide...! Each person has their own idea of what constitutes a good pet snake, depending on their experiences, life style, and length of time in taking care of snakes. A beginner would certainly want a pet snake that can be handled and maintained easily. Also, it would not advisable to invest too much on a pet snake that you are just beginning to explore and determine if this is the right pet for you. On this aspect, you should be aware that snakes normally live for a long time. If for some reason, you do not want to continue having a pet snake, you should be able to return the snake to a pet shop or find a ready buyer. In determining the ideal pet snake for a beginner, we will consider some aspects that normally affect the owner. The first aspect would be the average adult size of the snake. Your enclosure should normally be about two-thirds the size of its body length. If the length of the snake is six feet, then the cage should be about four feet long. You can make the enclosure longer than the snake but the snake is sufficiently comfortable in a small enclosure. This is critical if your home is not big and you have a limited area for your pet snake. You should also consider the expense in setting up the enclosure. You have to upgrade the enclosure as the snake grows bigger. You cannot have a big enclosure immediately as the snake will not feel secure in big surroundings. Pick a snake that has good temperament and behavior. They should be easy to tame and handle. Naturally, you would want to cuddle and play with your pet, and as such you should choose a pet snake that can be trained and follow your directions. Snakes are carnivore and enjoy eating rats, mice and other similar animals. You should expect to be handling rodents when feeding your snake. Pick a snake that will eat frozen or thawed rodents and are not finicky in their food. Snakes do not eat very often and you can stock the rodents in your freezer. Being a beginner, you might not be very knowledgeable on how to maintain your pet snake and keep it in good health. Some snakes do not adapt well to captivity and have to be managed with special care. 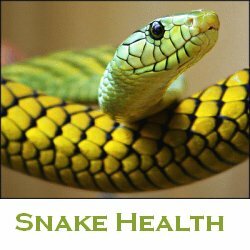 Pick a snake that is sturdy and does well in captivity from a health and wellness perspective. You should be aware that snakes are sensitive to temperature and humidity factors, and you should always ensure their enclosure is kept at the right temperature. In third place, the gopher snake and the ball python are good choices as pet snakes. They fall within the criteria except that the ball python can be hard to feed at times. You may have to try different types of food to feed the ball python. Both have good temperaments and do not strike back. The Kingsnake is another good choice as a pet snake. There are a variety of kingsnake species, such as the California kingsnake, grey-banded kingsnake, Florida kingsnake, and mountain kingsnake, all of which make good pets. Any of these varieties will average four to six feet long, eat well, and do well in captivity. Many people consider the corn snake as the best pet snake for a beginner. They usually average about five feet in length, exhibit good temperaments and can be easily tamed when handled frequently. This is a pet snake that you can play with safely and in comfort. You should handle them often and feed them regularly so they get accustomed to you. Snakes will live long and healthy lives as long as you provide them their basic needs and avoid over-feeding them. 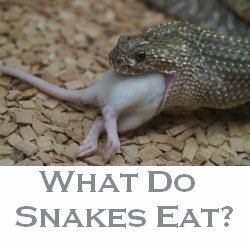 Seek advice on the amount of food for your pet snake and the frequency of feeding. They will eat whatever is given to them and regurgitate after a day or so if they are overfed. Snakes have a variety of colors and you may find one that is enjoyable to look at. Corn snakes make excellent pet snakes for beginners. They are generally tame, easy to take care of and do not get large. However, they are excellent escape artists and if you are not careful, you can lose your pet snake in a short time. 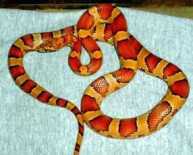 The housing of corn snakes should be well planned and thoroughly secured to prevent their escape. Aside from being easy to handle, they can have a wide array of beautiful colors and patterns through selective breeding. They are usually active at night or at dusk and dawn. A mature corn snake can reach from 3 to 5 feet long, and are carnivores. They can live as long as 15 to 20 years. Most of your initial expenses will be in acquiring or constructing an enclosure that can keep the snake safe and secure inside the enclosure. A long drum can serve as a cage for the snake. Small holes can provide ventilation. The most important part is having a secure tight fitting lid that can be clamped down tightly. Corn snakes will push at the lid with their noses looking for weaknesses and loose fits. 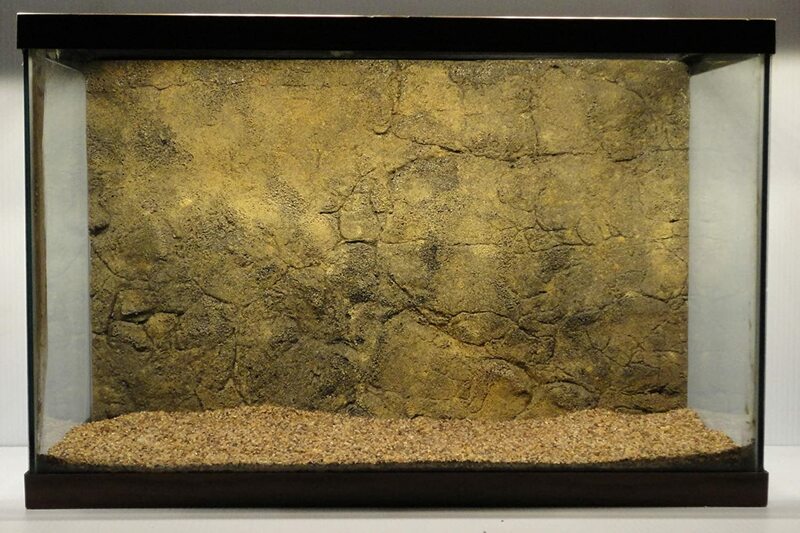 Seek advice from experienced snake handlers when constructing an escape-proof enclosure. Although the snakes are abundant and relatively inexpensive, it can become costly if they always escape from your enclosure. When choosing a snake, get one that is well fleshed with clear eyes, no cuts, no mites or ticks, and is alert. Newspapers are the best choice when selecting substrate for the enclosure. It is easy to clean up and replace. It might not look presentable but it will keep the snake comfortable and relaxed. When you become more adept at cleaning the cage, you can brighten the appearance by using Astroturf. You may need several pieces so you can rotate them regularly. The dirty one should be thoroughly washed and dried before using it in the cage. Do not use material which the snake might ingest accidentally while they are feeding. Snakes like privacy and you should provide them with sufficient hiding spots within their enclosure. A cardboard box with one open end will suffice. Make sure the cardboard box is just large enough for the snake to curl in. Snakes will not feel secure if the box is too large. Pieces of bark are good hiding spots if placed on a substrate that allows the snakes to burrow under them. Hiding places should be placed in both the warm and cool ends of the enclosure. Branches give the snakes a chance to climb. Water dishes should be available at all times. Snakes tend to defecate in water. Snakes also soak themselves in water, especially before shedding. Check the water regularly and replace it with clean water as often as needed. Be sure the water dish is heavy so it cannot be toppled over when the snake slides around the area. You can have several water dishes in the enclosure as it can also help establish the proper humidity in the cage. The proper temperature is necessary for the maintenance of the snake. A temperature of 21-29 degrees centigrade should be maintained in the cage. One end of the enclosure should be cool and the temperature should gradually get warmer towards the other end of the cage. An incandescent light can provide some heat and also serve as a basking spot. There are no lighting requirements for corn snakes. Snakes are carnivores and should be fed pre-killed mice. The larger corn snakes can take small rats. Hatchlings are fed small mice at the start, and the size of the prey increase as the snake grows. The prey should not be wider than the snake’s head. Hatchlings can be fed several times within a week while adult corn snakes should be fed one prey every ten days. Be observant since shedding causes a decline in appetite and correspondingly, the feeding frequency should be reduced. The ball python is an ideal pet snake for a beginning snake owner, since they don’t grow as big as other constricting snakes, are gentle and easy to handle. It gives the owner an opportunity of experiencing constricting snakes without the burden of caring for a long and heavy snake. The ball python grows to a maximum of 3 – 5 feet. The ball pythons got their names because they roll themselves into a tight ball, when they are threatened. They tuck their head inside their coils. Young ball pythons grow about a foot a year for three years, and maintain that length for the duration of their life, which on the average may be 20-30 years. Captive bred snakes are better than getting a wild caught snake. Wild caught snakes are normally stressed from the capture and transport from their location to the snake farm. They may also have a large parasite load. Although captive-bred ball pythons are known to be difficult to feed and more expensive, they are still considered the better choice over wild caught snakes. Choose your snakes from recognized accredited breeders so you can be assured of a good quality pet snake. Since this is your first pet snake, you might not know how to choose a snake. Indications of a good snake are a well rounded body, clean eyes and vent, and no signs of respiratory problems. They should appear alert, curious and grip you firmly but gently when handled. Be present when they are fed so you can observe them and see that they are eating well. Ball pythons are not active and a 10-20 gallon tank for young snakes will suffice. As the snake grows, you may need to increase to a 30 gallon tank. They are resilient and persistent in finding ways to leave their enclosure, so you should have a securely fitted top. It should be tight and firmly locked in place to prevent them from pushing against the lid and forcing it open. Even just a slight crack is enough for them to slide out and escape from the tank. Newspaper makes good substrate. It is cheap and can be replaced easily. Astroturf is also a good alternative. It can be cleaned, dried and reused several times before it wears out. Soak the soiled Astroturf in one gallon of water with 2 tablespoons of bleach, rinse and dry well. Snakes should also have a sturdy branch and several hiding places. Snakes feel secure when they are in a small dark place. A cardboard box with an opening will suffice. The size should be just right for the snake to coil in. An overly large box might give the snake some stress and apprehensions on their security. Hiding places should be spread in both the cool and heated areas. You may have to upgrade the hiding places as the snake grows bigger. Temperatures are critical to the temperament of the snake. The temperatures should be maintained at 27-29 degrees centigrade, with a basking spot of about 32 degrees centigrade. Any deviation from these temperatures will affect the snake and result in health disorders. Keep heating elements and light bulbs away to avoid causing burns on the snake. Put thermometers around the cage to closely monitor the temperatures around the cage. It is worth the extra effort to ensure your pet snake is comfortable in their surroundings. There are no special lighting needed for ball pythons, but you should try to maintain a day and night environment to preserve the light and dark cycle the snake needs. There should be sufficient water not only for drinking but for humidity and soaking during sheds. Be sure the dishes are always full of water. The water should be clean and if needed changed regularly since it can get dirty from the defecations of the snake. Ball python snakes should be fed pre-killed mice or small to medium sized rates depending on the size of the snake. Feeding is done every 1-2 weeks. Any excessive feeding could result in regurgitation and health disorders. Have the snake get used to your feeding them so they will recognize you and not confuse you for their prey. Constricting snakes is one group of snakes that can be considered for pets. You should be selective when choosing a constricting snake as a pet since there are specific varieties that make good pets for beginners and there are other varieties that definitely are not qualified to be pets. Check on the different varieties and seek advice from pet stores and experienced veterinarians. Zoos are also good sources for learning about pet constricting snakes. Although they have a common trait in that they kill their prey by suffocation, they largely vary by habitat, history and care requirements. Boas and pythons bring to mind killer snakes due to movies and media write-ups, but there are some that are quite docile and can be easily trained. You just need to know the specific varieties that you can bring home and have as pets. Large constricting snakes, such as 8 feet or more in length, can be difficult to maintain because of their size and weight. A large constricting snake will require a very secured, firm and stable cage because their weight and force can break structures easily. Also you may need two or more people to handle these large pet snakes, and not many people enjoy handling snakes, especially one that can squeeze you to death. If you are alone, the snake could coil around you and squeeze you till you die from suffocation or broken ribs. The presence of other people will help prevent incidents of that nature. A safe guideline is 1 person for every 4 feet of snake. Feeding is a vulnerable time, and it is recommended that other people are present to assist if needed. Fortunately, snakes do not eat often, about every 10 to 14 days. Burmese pythons are generally gentle but are big and powerful snakes, and have been known to get involved in fatal incidents. Red tailed boas are not as large and are acceptable as pets but not recommended for beginners. Some reticulated pythons have a nasty temperament and should be avoided. Pet stores can help you get a captive-bred pet snake that is docile and good for beginners. They can also orient you on the care of pet snakes. Captive-bred snakes are tame, less nervous, less stressed and less diseased. It will be easier feeding them since they are accustomed to eating killed prey. Choose a terrestrial species since tree pythons and boas have stricter needs for housing, humidity and environmental control. The ideal constricting snake is a captive bred ball python. Their adult size is fairly small, about 3 to 5 feet in length, and is not very particular about their environment. However, ball pythons are notorious for refusing to feed in captivity, and this could lead to an early demise of your pet snake. Ask the pet store owner to demonstrate how to feed it and check on the ready availability of its killed prey. It may be exciting to watch the python snake go after a live prey but remember the live prey is fighting for its survival and will do anything to get away from the snake. It might harm or injure the snake in its attempts to escape. A pet snake, like other pets, cannot be left alone for an extended length of time. The temperature and humidity in the cages have to be monitored and maintained, and feeding should be provided at regular intervals of 10 to 14 days. A healthy ball python snake can live from 30 to 40 years and you need someone to take care of your pet snake if you must go away for a long time. The care and housing arrangements differ between different species, and you should check it out with the veterinarian, zoo keepers and pet store owners. Inclusion body disease (IBD) has been found in boas and pythons and is believed to be a retrovirus. The way it affects these two groups of snakes is slightly different but the end result is the same – terminal. You should have the snake undergo regular checkups since there are asymptomatic carriers which might not show any symptoms until much later on. The fact that a snake does not show any signs of the illness within an infected collection does not mean it is immune to the disease nor does it imply that it did not get infected by the disease. Some signs of infection include central nervous system disorders, such as paralysis, unable to right itself when turned over, inability to strike or constrict, chronic regurgitation, extreme weight loss, respiratory infections and inability to shed the old skin effectively. Pythons may also exhibit mouth rot, exaggerated reflex responses and loss of motor coordination. The disease spreads fast in young and juvenile boas and pythons. Although it has been found in boas and pythons, we cannot discount the possibility that all boid snakes may be susceptible to the disease. While the disease has not been identified in non-boid snakes, it is unknown whether non-boid snakes carry the virus. The host of this virus has not yet been identified but snake mites are suspect since they were found in dead boas and pythons. IBD has been classified as a viral entity and may spread like a virus, through direct contact, airborne or other parties such as snake mites or the keeper who passes the virus during the course of handling or cleaning. The disease can be diagnosed in live snakes through blood tests. Currently, there is no treatment for the disease and as it is fatal and highly contagious, there is no alternative except to apply euthanasia to infected snakes. Even if the snake can be kept alive through supportive measures, the damage to the nerves, brain, spinal cord, and internal organs are so great and progressive that the pain increases with no signs of recovery. It is more humane to put them out of their misery. All newly acquired snakes are normally quarantined for at least 6 months before being allowed to join other snakes. Aside from observing the snake for indications of the disease, the time is used to get the snake acclimatized to its new surroundings and allowing it to become calm and relaxed. Although it is not definite that snake mites are the main cause, they are considered a high risk in the transmission of the disease to other snakes, thus making it essential to control and eliminate mite infestations in all reptile enclosures. Wooden cages should not be used unless sealed with urethane or other reliable sealants to prevent the migration of mites from one enclosure to the next. Fibroglass cages should be cleaned with Clorox and left to dry properly. Since the source of the disease is not determined to date, it is recommended that the snake undergo blood tests regularly. Also observe the movements of the snake and see if it starts exhibiting some signs of the disease. There is no cure but you should ensure that it does not spread and affect the snake community. Now I want to tell you about the ultimate snake care book, snake breeding book, and snake health care book! This Pet Snake Guide is the Perfect Snake Care Book for you! “The Ultimate Guide To Snakes” is from front to finish an easy to follow guide on every possible thing you would need to know on owning and having snakes. * What is the perfect temperature to keep your snake and how to do it…Be warned though not all snakes like it Hot! * Did you know, a snake is cold blooded so there are certain things You Must Do to help it survive! Imagine how you will feel when you show your friends, family and work colleagues your amazing pet… Let me assure you that once you have a snake your life will never be dull or boring again. They are such fascinating creatures people will be popping in just to see them. 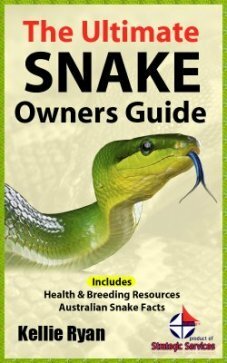 This book is a must have books for someone starting out or even the experienced snake owner. And the next two sections of the book will take you to a new level of know-how on the Health and Well Being of Snakes and How to Breed and Keep Healthy Snakes. As mentioned earlier Snakes are low maintenance, low cost and high health creatures. However occasionally you will run across the odd health problem, you need look no further than these precious books. Section #2: “Keeping Your Snake Healthy” contains pages of pure gems such as the fact that snakes are not capable of coughing or sneezing and what you must do if they have a respiratory infection. 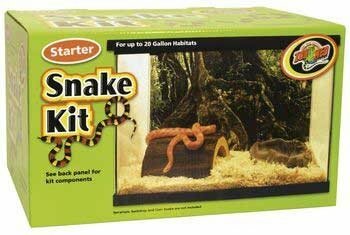 This is book is essential if you should happen to have a sick snake. Section #3 “Successful Snake Breeding” takes you into the interesting, exciting but often difficult world of snake breeding. This step-by-step guide will show you exactly what to do for your breed of snake and how to have success. The reason others have had trouble breeding is people don’t know the rules of success. Finally this incredibly powerful book has removed the “veil of secrecy” about how to breed snakes. Anyone can now breed their snakes. Who knows, you could even turn your hobby into a profit making business. When it comes to knowing how to look after a pet snake you will be surprised how much gear you do need to get to set your pet snake up initially. After that they are very low maintenance, apart from the supply of rather exotic foods that snakes eat. Most pet suppliers will be able to provide you with frozen mice to feed your snake etc. 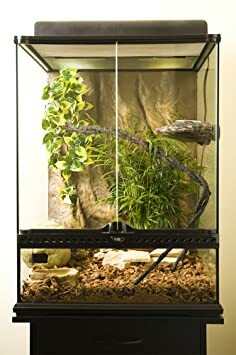 but for the snake cages or snake terrariums, and snake handling and feeding equipment, you can actually get some great deals online. And when you buy from the links here you will often get big savings off normal retail prices, and even free shipping to your home sometimes. If you are in the business of selling snake related products, or blogging about snakes to exotic pet owners I have three PLR article packs on offer here that are about pet snakes and another one that is about the exotic pets niche topics . 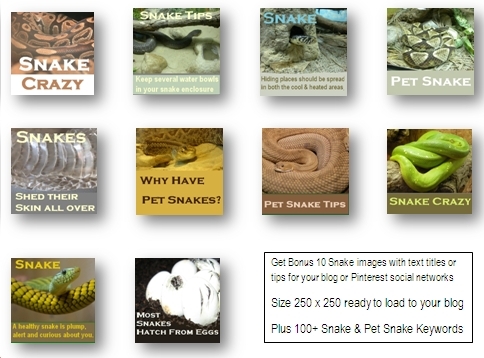 In my three exclusive pet snake PLR article packs there are not only 5 articles in each set, but also a bonus 100+ snake and pet snake keywords and also very special bonus 10 royalty free snake graphics (different mix of assorted images) in each pack included as well. These graphics are presized ready to load on your blog, are exact size for Squidoo intro modules, and the original images have the appropriate commercial use copyright. I have added Titles and/or Snake Tips to them to make them more interesting for people who use Pinterest in their social marketing. Just click the links below to see each of the three various pack sets of 5 PLR article titles, 10 graphics in the pack, sample of one article snippet, and remember that you also get another bonus of over 100 top keywords for the Snake pet niche. 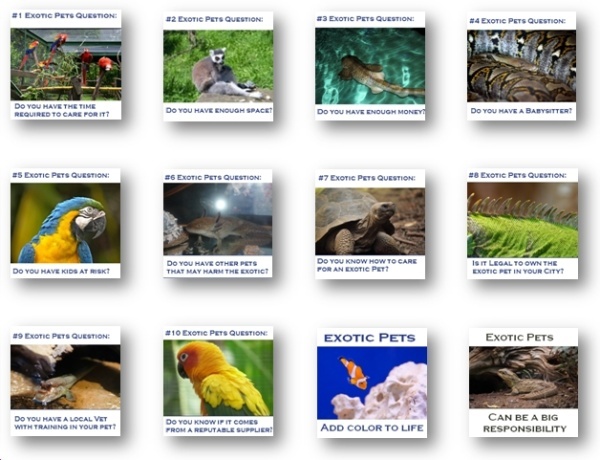 See below the articles list here for the information about my exotic pets PLR article packs with bonus graphics and keywords. Is It Hard to Care for Exotic Pets? Owning an exotic pet requires a high degree of responsibility and commitment. Unfortunately, many people rush into the decision to own or adopt an exotic pet. They’re cute, they’re cool and they’re fun. The rest will figure itself out, right? Actually, that’s rarely the case. Let’s take a look at the most common mistakes exotic pet owners make so you can avoid them. Mistake #1 - Rushing into it. One of the most common mistakes exotic pet owners make is buying on impulse. It happens to the best of people, particularly if the pet is in need of care and you’re looking to adopt. However, it’s incredibly important to avoid this temptation. Educate yourself ahead of time. Look into the behavior, care and needs of the pet and be sure you’re ready to take on the responsibility before you bring an exotic pet home. Mistake #2 - Not preparing your home before the pet arrives. Most exotic pets have very specific habitat requirements. They may need ultraviolet lighting, trees to climb, places to hide or even a few more of their species. Make sure you have everything you need set up and waiting before you bring an exotic pet home. Mistake #3 - Not investigating veterinary care ahead of time. There is a real chance that you don’t have access to a local veterinarian who knows how to care for your exotic pet. Many veterinarians are educated about domestic pets but not exotics. That means your pet isn’t going to get the health care it needs and deserves. Find a veterinarian before you find an exotic pet you want to adopt. Mistake #4 - Not educating yourself. Do you know what your pet eats? Do you know what behaviors are normal or abnormal? Do you know what habitat to create for your pet that will provide them with the happiest existence? Do you know what health problems to look for? It’s vitally important to educate yourself on your desired exotic pet before you buy them. Mistake #5 - Not making sure your pet is legal. Many exotic pets are illegal to own and different states and cities have their own regulations. When an illegal pet is brought home, you risk losing that pet to the authorities and paying a hefty fine. It’s an unfortunate situation all the way around. Make sure it’s legal to have your exotic pet before you bring them home. 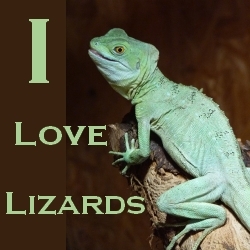 Owning an exotic pet can be an extremely rewarding and enjoyable experience. They can add something to your life that a domestic pet cannot. However, before you make the decision to buy or adopt an exotic pet, make sure you’re 100% prepared for the responsibility. Educate yourself, check your resources and make sure you can provide a great life for your exotic pet. 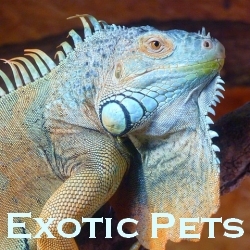 Which Exotic Pet Is Right for You? So you want to buy an exotic pet. It’s understandable. There are many benefits and rewards to owning an exotic pet. However, before you run out and buy the cutest or most interesting pet you can find, it pays to take a step back and make an educated decision. Here’s how to determine which exotic pet is right for you. * Is the pet legal to own? Not all pets are legal in all areas of the country. Spend some time reviewing your local laws and regulations as they relate to exotic pets. Find out what pets are not allowed and scratch them off of your list. 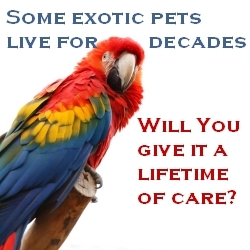 * Lifespan - Many exotic pets live for decades; we’re talking 30, 40 even 50 years. This is quite an investment and responsibility. * Other pets - What other pets do you have in your home? Some pets are completely incompatible with others. Make sure the pet you choose will get along with the pets you already have. * Children - Do you have small children? If so, you’ll need to tread carefully. Many exotic pets are not compatible with small children. Be very careful when choosing an exotic pet if you have little ones. 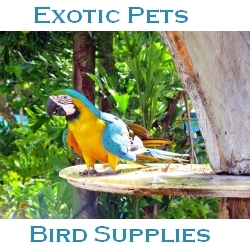 * Space & equipment - Many exotic pets have very special needs. You’ll want to investigate these needs before you make a commitment and bring on home. 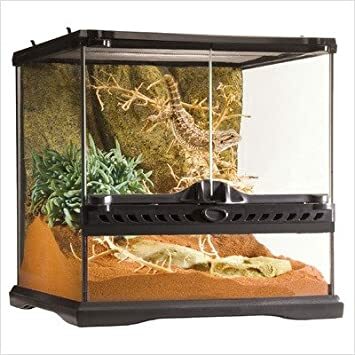 Make sure you not only have the room for their housing but also that you can afford the equipment required to properly care for your desired exotic pet. * Time commitment - Some exotics are fairly easy to care for; others require full-time attention. Lemurs for example require constant attention, whereas a sugar glider may be content by themselves for a while. * More than one? 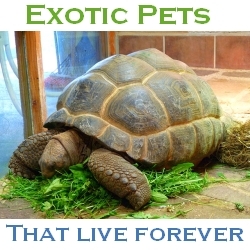 - Several exotic pet breeds require companionship. They live in groups and getting just one will result in behavior and perhaps even health problems. That means if you want one, you have to want two, three or more. Are you prepared for this? * Pet Size - How large of a pet can you accommodate? If you’re in a smaller home or apartment, then size will be an issue. 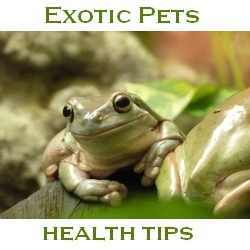 Before you head out to purchase an exotic pet, it’s recommended that you create a checklist. Write down some animals that are legal and you think would accommodate your needs and surroundings, and then create your checklist. Make sure you’re making the right decision before you bring your new pet home. This is not an exclusive pack to here, but it is very good quality and has hardly any exposure at all on the net so far. I have included with these 10 exotic pet PLR articles a set of unique graphics that I have created for this pack. You also get another bonus of 100+ top keywords in the exotic pets niche to help target your search engine marketing campaigns. 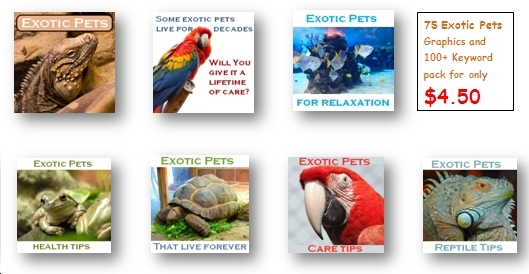 Get 75 exclusive exotic pets graphics that feature text titles and tips on this niche. Great for use on your blog or on your web2 properties as they are pre-sized at 250 x 250. Interesting tips and questions make these graphics perfect for Pinterest marketing! All images are sourced from websites offering appropriate commercial use of these pictures.